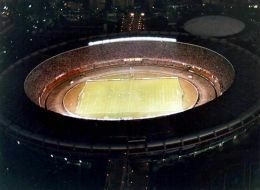 The Maracana is a stadium in Rio De Janeiro, Brazil, which holds 96,000 people. It was first opened in 1950 to host the FIFA World Cup but has mainly been used since to host the matches between the largest clubs in Rio De Janeiro (including Flamengo, Botafogo, Vasco De Gama and Fluminese). The stadium once held an astonishing 200,000 people and the attendance at the 1950 FIFA World Cup final was 199,854. Despite the reduction in capacity the stadium is still the largest in South America and is due to hold the World Cup Final in the 2014 World Cup; it will become only the second stadium to host the World Cup Final twice.